TJ Hughes: How to nail it this Christmas!! How to nail it this Christmas!! Nail art is massive this season and we couldn't be happier. It is so easy to change the colour and design to match your outfit or your mood. You can make a bold statement and then you can wipe it away. If your nails are not looking their best try our range of Sally Hansen nail treats. The range includes continuous growth treatment, Vitamin E nail, gel cuticle remover and cuticle massage cream and will have your nails looking tip top in no time. Now that you have lovely healthy nails you can start thinking about the polish. These Evie Mai nail sets are fantastic for every occasion, perfect for the party season or as a gift for Christmas. There are a range of sets available depending on the look you want. 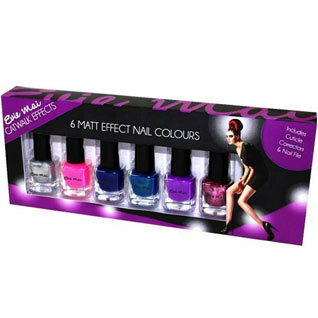 For up to the minute nails this matt effect set is perfect. Includes 6 bottles in silver, pink, blues and purple shades plus cuticle corrector and nail file. For something completely different this magnetic effect set is perfect. Apply 2 coats and on the second coat slowly wave the lid of the polish, which is magentised, over the nail and see the striking effect emerge before your eyes. This set also includes cuticle correctors and nail file. This mood set changes colour depending on your body temperature (even if you are holding something hot or cold) and will keep changing for as long as you wear them!! With 3 more sets to choose from; glitter, metallic and pastels we are sure there is a set for everyone.